The modern-day waterworks, engine-houses, filter beds and reservoirs that today dominate the western end of Hampton and beyond came to Hampton as a result of the Metropolis Water Act of 1852, which prohibited the taking of water from the tidal Thames. This Act came about after years of pressure on the government to do something about the filthy and polluted state of the river in London, which was to lead to the “Great Stink” of 1858 near the Houses of Parliament. The Act meant that Thames river water had to be taken above Teddington Lock. In practical terms the first place above the lock, with suitable land available for Waterworks, was Hampton. As a consequence, by 1855 the Southwark and Vauxhall, the Grand Junction and the West Middlesex Water Companies had all established works at Hampton. In 1903 these companies became part of the Metropolitan Water Board, later Thames Water Authority and then Thames Water plc (since acquired by a German company and subsequently sold to an Australian finance group). 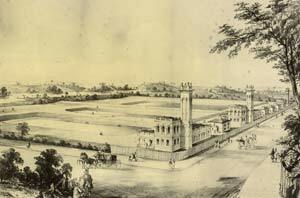 The Hampton Waterworks were, and still are, huge undertakings. Large numbers of navvies worked on the construction which, with many changes and additions, took place over many years and indeed still continues to this day. The navvies lived mainly on “the Common”, later known as New Hampton and then Hampton Hill, in “hovels” and “wooden shacks” and were responsible, in part, for the growth of what became Hampton Hill, with its own separate parish from 1863 onwards. The works had their own machine shop and their own fire brigade and there was even a navvies mission in the 1890’s for labourers and others working on the extensions to the Waterworks. By 1903 there were 4 reservoirs and 40 filter beds as well as the huge pumping houses and river intakes. The Waterworks employed large numbers of people and even had their own narrow gauge railway from 1915. This railway connected the riverside Coal Wharf to the pumping stations in Hampton and at Kempton Park. 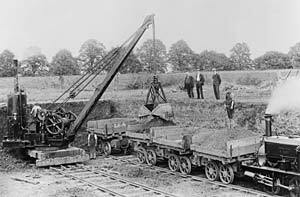 Over 100 tons of coal were needed each day, and until the railway was built this was hauled by horse and cart, after being unloaded from barges which usually brought the coal up-river. In times of flood, when the Coal Wharf could not be used, or if the river workers were in dispute, the coal came by the mainline railway, but still finished its journey by horse and cart until the narrow-gauge railway was built. There were three locomotives, Hampton, Sunbury and Kempton. None of them survive today although the railway track bed still exists in many places and has been protected in the local Development Plan. 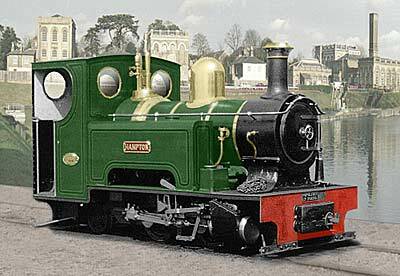 This reconstructed colour image of the locomotive Hampton was created for Hampton Online by John Inglis. In 1914 labourers were paid 28/- (£1.40) for a 54 hour week with some working up to 72 hours. By 1937 there was a minimum wage of 60/- (£3) for a 47 hour week. In recent years the numbers employed by the Waterworks have declined dramatically with improved technology and pressures to reduce overheads. In 1997/8 the small Station Road filter beds were replaced by housing and the modern-day “village-green” built on the site. By coincidence the “new” village green is approximately on the site of the original village green which disappeared around 200 years ago.